KYOTO - With the 2025 World Expo secured for Yumeshima district in Osaka Bay and growing confidence the man-made island will also host one of Japan’s first casino resorts, Kansai’s business leaders are stepping up efforts to win local approval and central government funding for major transportation infrastructure projects over the next two decades. 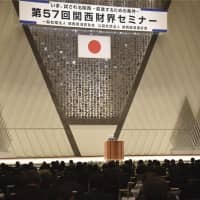 At the annual Kansai Economic and Management Summit, which concluded Friday, there was an air of satisfaction and anticipation that the Group of 20 Summit in June, the World Rugby Cup later this year, as well as the 2025 Expo and a possible casino, will mean an increased flow of tourists to the Kansai region in the near and distant future. New rail links were on the minds of some participants — nearly 680 corporate leaders in the area to came to participate in sessions on topics including the digital society, the aging workforce and Kansai area tourism — especially the controversial maglev line, a new shinkansen that will transport passengers at blazing speeds in magnetically levitated cars. Kansai business leaders are stepping up lobbying efforts locally and in Tokyo to ensure the maglev is extended to Osaka by as early as 2037. If completed, the maglev would cut the travel time between Osaka and Tokyo to just an hour, instead of the current 2½ hours required by regular shinkansen. While there are cost concerns and questions remain about whether people will even use the train, since it’s also only about an hour to Tokyo by air from Osaka, railway executives justify it as a way to make areas west of Osaka more easily accessible to tourists by train. “A maglev train to Shin-Osaka Station means it will be a major transportation hub,” said JR West Vice President Nobutoshi Nikaido, adding it would make it easier for foreign tourists to then get rail connections from Shin-Osaka Station to the Seto Inland Sea, western Honshu and Shikoku. That’s the biggest rail project Kansai’s leaders want funded, but not the only one. The Hokuriku Shinkansen Line extension from Kanazawa, Ishikawa Prefecture, to Tsuruga, Fukui Prefecture, is expected to be completed by 2023, and the Kansai political and business communities are trying to secure public and private funds for the final link between Tsuruga and Osaka stations. In addition, plans are underway in the city of Osaka to construct a new north-south rail line that would run through the western part of the city. If realized quickly, the line could open around 2031. 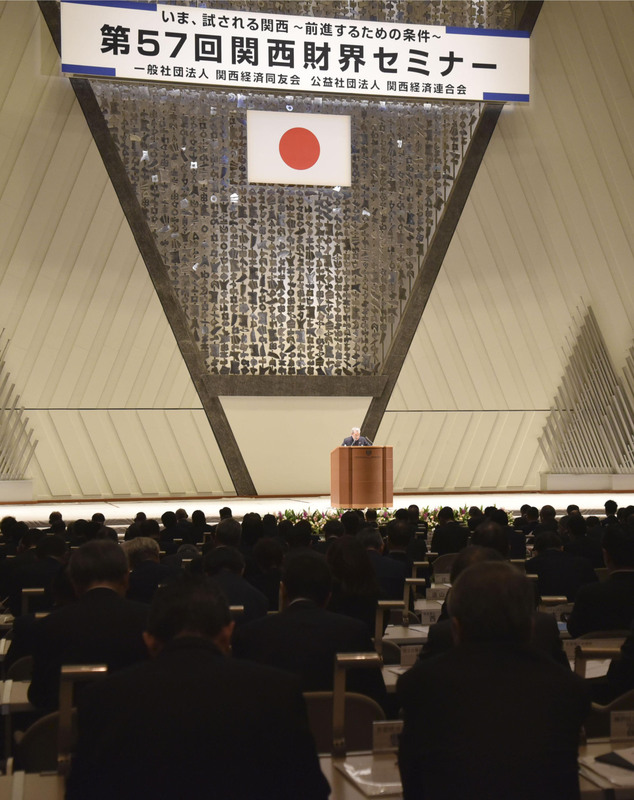 The summit also dealt with more immediate transportation infrastructure concerns, namely, links to Yumeshima, where the Expo will be held and a casino complex could be built. There is no subway access to the island at present, but an extension is to be constructed. Who will pay for it and whether it will open in time for the 2025 Expo remained the top worries for business leaders at the summit. And if a casino resort is to be successful, other participants added, more than just a gaming floor will be needed. “In order to improve the city’s international brand, it’s necessary to have an (integrated resort) complex with a large-scale international conference hall and exhibition facilities. A committee should be established to invite international conferences and exhibitions to the facilities,” said Shinichi Fukushima, president of the Osaka International Convention Center.